On Saturday, April 5, the Clean Energy & Jobs Oakland Campaign of the Oakland Climate Action Coalition hosted a community forum and town hall on the future of energy in Oakland: "Growing Clean Energy Jobs in Oakland." Many thanks to all who partnered, participated, spoke, and volunteered! Youth UpRising in East Oakland provided the venue for an exciting day of people-powered solutions for climate action, clean energy, and jobs. 100 people of all ages and backgrounds representing the beautiful diversity of Oakland, and over twenty partnering organizations came together to explore possible answers to the questions, "How do we create more jobs for our community, especially our youth? Is it possible for those jobs to be good for people AND for the planet? ...and how can the COMMUNITY, including youth, lead the way?" 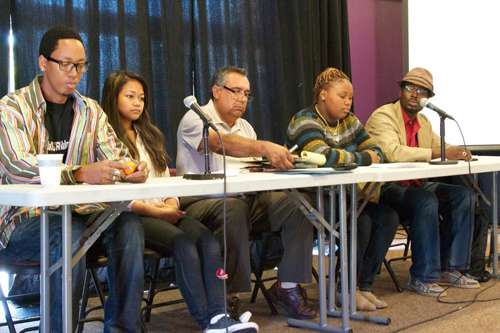 The program featured a community leaders panel, with speakers from ILWU Local 6, OUR Walmart, Communities for a Better Environment, and students of SUDA Works, a jointly-run Castlemont High School & Youth UpRising green jobs training program. The program also included five breakout sessions focused on the intersections of Community Choice energy with environmental justice and community health, food justice, youth leadership, and people-powered solutions for energy democracy. From the excitement in the air, you could tell that Oakland residents are ready for community control of our own energy destiny, to build our health and our wealth while taking local climate action. This was the first such event organized by the Campaign, which since 2012 has been working to create hundreds of local, family-sustaining clean energy jobs for Oakland residents through an East Bay Community Choice energy program. The Campaign is currently meeting with Oakland City Councilmembers, and building our base of supporters to ask for a Council resolution advancing Community Choice energy before the end of the year. Interested in getting involved and making a difference in your community? We could use your help! Please contact Campaign Coordinator Colin Miller at colin@baylocalize.org.